Obama was making it clear that by “resolve,” first and foremost he was speaking to the recent terrorist attacks in Paris. Like the speech on climate change that would follow, it was a call to preserve the kind of world order that he represents. “Our world,” he called it, but while Westerners, liberals, Americans, and mainstream environmentalists may be quick to count themselves in that number, that easily made assumption must be weighed against reality. While it can and has been argued that the thwarted mass assemblage under the umbrage of corporate friendly NGO’s would have done nothing of substance in the face of deeply rooted technological, economic, and cultural realities that shackle us toward hastening climate disaster, it must none the less be said that what the French government did is antithetical to basic freedom. The suspension of foundational rights, the right to peacefully assemble and the right to free speech, could not have been lost on former constitutional lawyer Obama. It is for this reason that Obama’s characterization of the continuation of the climate summit in the face of violence as an “act of defiance” must be seen for the Orwellian appropriation of reality that it is. The only act of defiance that occurred were those few people who protested in spite of the French imposition of rights restrictions, but Obama would take hold of that spirit, however limited it may have been, and make it the property of his elite audience. This then raises the obvious question, who exactly was Obama referring to when he said, “What greater rejection of those who would tear down our world than marshaling our best efforts to save it?” Was Obama speaking of the terrorists who were unable to prevent the climate summit from occurring (but who managed to have the French government reactively undermine its own supposedly core Western principles), or was the president speaking of the activist rabble who, out of an elite preserving security-state decision, was unable to show up at their doorstep and interrupt their party? In either case, the “best efforts” that were “marshaled” was Obama’s recognition of the world’s cream of the crop, and was an expression of flattery likely meant to entice world leaders to see themselves as potential members of his club against a backdrop of disempowered people who had been dissuaded from coming out. If, then, by saving “our” world Obama is in fact tacitly supporting the dissolution of widely understood basic rights enshrined in the very Western civilization he is ostensibly looking to preserve, his call to action is not directed at the majority of people, but fittingly, it is aimed at those high level statesmen in attendance whose views fall in line with elite US interests. His stated goal to “protect our people and uphold the enduring values that keep us strong and keep us free,” could just as easily refer to the enduring values that keep the elite classes, his people, strong and free, and by free, this would mean free to do as they please without repercussions, in spite of their growing fears of system destabilization and the resulting desire to fortify themselves and weather mass social discontent. His words were a kind of reassurance to those present. The values he cited, which allow for the actual state of affairs of deep hierarchical divisions with clear insiders and outsiders, can be found both in capitalism and Machiavellian statecraft, which form the actual foundations of modern international affairs, rather than the widely believed myth of representational democracy. Whether or not this was the intended subtext sent to the elite interests listening in, it is certainly embodies the reality of what his administration represents, and is a clear indicator of what is to come. While the official narrative for avoiding a legally binding treaty is to ensure that it won’t be torpedoed in China or the US republican controlled congress, the very notion that this international agreement, whose targets won’t be enough to stave off catastrophic climate change any way, won’t even be enforceable by law, makes the whole affair into a complete eleventh hour farce, unless of course you are member of the elite club presiding over this whole mess, where the opportunities to declare your good intentions to an increasingly restless public make for a good insurance policy. The world is not “our world” in the way Obama’s speech would have us believe. “Our” refers to those few who in fact literally own the planet, a group populated by corporate executives, heads of state and ruling dynasties, and the eighty five individuals who literally own as much wealth as the poorest half of the rest of the 7 billion plus inhabitants of the globe. When Obama says “our planet,” the commander of America’s global empire is not opening the doors of inclusivity which in fact remained shut and closely guarded by Paris security. He’s staking a hegemonic claim, or perhaps more accurately, reinforcing it. 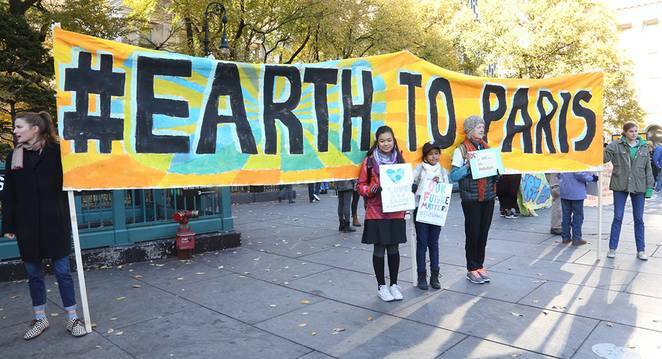 In contrast to what Avaaz was suggesting, however, what made the march impossible was nothing more than the lack of will and leadership within the so-called climate movement itself to make it happen. It was a signal to the owners of the planet that by and large, under the direction of NGO middle management, the owned would in fact remain compliant. Seen in this light, perhaps the most meaningful thing that could have been achieved at the global summit would have been the refusal of the hundreds of thousands of people planning on marching to be deterred by the wishes of the authorities. This, of course, was unlikely to have happened, because the event itself was steered by groups friendly to US interests, like Avaaz, who stated on their website that “The police have just informed us that the tragic attacks in Paris have made the march there impossible. Now it’s even more important for people everywhere to march on the weekend of November 29th on behalf of those who can’t, and show that we are more determined than ever to meet the challenges facing humanity with hope, not fear.” Their word choice is clearly channeling Obama, another subtle signal of an alignment of interests. In contrast to what Avaaz was suggesting, however, what made the march impossible was nothing more than the lack of will and leadership within the so-called climate movement itself to make it happen. It was a signal to the owners of the planet that by and large, under the direction of NGO middle management, the owned would in fact remain compliant. But instead of confronting the illegitimacy of the power structure, she chose to consent to its mandates and maintain her safe distance, affiliating herself with the marginalized voices of those without a megaphone, though it would be hard to take such a position seriously given her enormous following, her best selling books, and perhaps most glaringly, the megaphone and media attention the Guardian had just given her to write her own piece of acquiescence.Given the dire, life destroying straights are facing, there would be nothing particularly radical about calling for mass civil disobedience to those unconstitutional decrees. It’s a fairly standard tactic from the playbook of Gandhi and King, who are cited ad nauseum by activist leaders attempting to coral their flock into a nonviolent strategy for change. But instead of confronting the illegitimacy of the power structure, she chose to consent to its mandates and maintain her safe distance, affiliating herself with the marginalized voices of those without a megaphone, though it would be hard to take such a position seriously given her enormous following, her best selling books, and perhaps most glaringly, the megaphone and media attention the Guardian had just given her to write her own piece of acquiescence. As the author of the “Shock Doctrine” Klein is well aware of governments using disaster to consolidate power. She even spoke about it to the Nation on the streets of Paris. But because she would not use her position to do anything more than advance her street cred and take advantage of the Paris scene as a kind of product placement opportunity for her “shock doctrine” analysis, she did little more than advance her own brand. She can neither be considered an activist, nor even a neutral reporter on the events on the ground. The conciliatory language she chose, though sprinkled with mild critique, helped shape the compliant activist landscape. She didn’t simply report on the cowed activist reality; she helped create it. She didn’t simply recount the governmental overreach; she helped reinforce it. The conciliatory language she chose, though sprinkled with mild critique, helped shape the compliant activist landscape. She didn’t simply report on the cowed activist reality; she helped create it. She didn’t simply recount the governmental overreach; she helped reinforce it. 350.org was also quick to speak out of both sides of its mouth and ultimately maintain its position of subservience to the death machine. From its website: “While 350 as an organization does not agree with all the actions of the protesters at Republique, we will continue to stand against any attempts by authorities to use these incidents to unnecessarily clamp down on civil liberties.” The green group’s statement went on to praise the words of Klein, and then announced that “Non-violent demonstrations such as these are at the heart of any progress on democracy and climate. People power is the only solution to the state of climate emergency. Together, we will continue to explore how nonviolent civil disobedience, creative action, and mass mobilization best fit together to achieve our goals.” What should be noted is that while the language here attempts to appeal to the activist community, it once again falls short of calling for mass civil disobedience to authoritarian laws at what is seen to be the most important climate summit to date. Instead, such language reaffirms 350’s leadership position in reducing such forms of dissent by relegating these tactics to some bureaucratic limbo, where they will “continue to be explored,” rather than be decisively enacted. 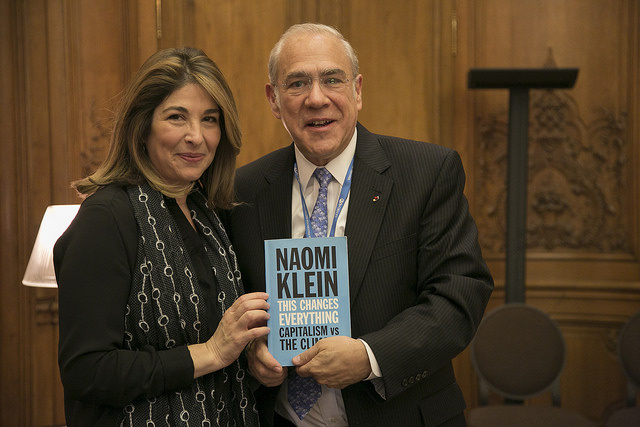 24 November 2015: Naomi Klein (left) and Angel Gurría, Secretary-General of the Organisation for Economic Co-operation and Development (OECD). [Photo: Julien Daniel / OECD] Gurría launched the “New Approaches to Economic Challenges”, an OECD reflection process on the lessons from the crisis with the aim to upgrade OECD’s analytical frameworks and develop a comprehensive agenda for sustainable and inclusive growth. With an extensive background, Gurría’s serves on the Advisory Board for the Global Green Growth Forum. 2) The climate marchers generally didn’t believe that what they were doing would have any real effect, and were willing to not show up because it really didn’t matter any way. In this case, their engagement in climate action is primarily a feel good social exercise, a hollow activity lacking in any real conviction, existing simply because they don’t know what else to do. 3) The climate marchers are generally uninformed about the seriousness of the situation and don’t believe that climate change is an immediate threat. Not showing up is not a big deal because there will be other marches and plenty of time to address the climate issue in a way that conforms to official decorum. The unsurprising response of the well orchestrated, no-show climate march in Paris represents the flip side of Obama’s authoritarian circle of power. That flip side is the highly conditioned, fearful, obedient, and unquestioning mindset which had the opportunity, the motive, and to some extent, the moral cover to send an uncompromising message to the very establishment that is producing the conditions that are unraveling the living earth system. Instead it took a pass. It is from within the framework of this understanding that the unfolding of the Parisian government’s decision to ban protests and the resulting, much diluted COP21 march should be viewed. It fleshes out why the rise of an increasingly authoritarian police state is an almost forgone conclusion in the face of climate change. While there is nothing to suggest that the Paris terrorist attacks themselves were motivated by climate disruption, they were in fact a product of Western imperialism, a fact which continues to be substantiated by investigative journalists, academics, independent researchers, and ex-government officials. In other words, the same forces that are responsible for climate change bear a significant responsibility in the creation of ISIS and thus the terrorist attacks, as well as the police response to those attacks and their response to the following COP21 climate march. Now let’s take a cue from the establishment and imagine for a moment that the terrorist attacks had stemmed to some extent from climate disruption. This thought experiment is inspired by a dubious argument put forth by Bernie Sanders and Prince Phillip about the particular origins of the war in Syria, but it’s general theme bears real possibilities for the future. Imagine, then, a person displaced by extreme drought who finds solace in newfound extremist religious ideologies. Perhaps this individual has family members who were killed in US imperial wars, and now he cannot find work because the crops have failed for several years in a row, food prices have risen dramatically, and the economy is in a slump. In time this person is able to find an outlet for his rage and a degree of stability and even self respect while receiving training through a foreign financed terror network that eventually brings him to a major city center with the intention to cause mass harm. So his ideologies are steeped in radical and violent religion, but, unknown to the nation and people affected by his actions, the multi-year drought helped push him over the edge. Would the response by the authorities in Paris and the climate activists have been any different? The reason that the implications of this scenario are important to consider is as follows. Those who are most negatively effected by this hypothetical attack, or the very real and recent Paris attack, are average people, the very people told to go home at COP21, who at least on the surface would have preferred to have been there in spite of supposed security risks. The people that are most likely to benefit from these real and imagined attacks are by contrast the ones sitting inside the conference, along with their industry supporters. When you cut past the fear and preconceptions of a “correct” (officially sanctioned) way of handling the aftermath of a terrorist attack and examine what is actually taking place, a disturbing picture emerges. The creators and beneficiaries of disaster are using armed enforcers to tell the victims of that disaster that they aren’t allowed to have a voice in protecting themselves, because of a supposed threat from the fruits of that very elite driven disaster. And the people, for the most part, agreed to this arrangement. To put this another way, the demonstration that actually occurred at COP21 was a demonstration of the weakness of the people at large, and the predatory nature of those who preside over them.